We just wanted to let you know that Jack Sutliffe, The Sewing Machine Doctor, is in the hospital and will not be coming to the Shop tomorrow. If he plans on coming down before the next scheduled Thursday, we will let you know. Please feel free to pass the word or e-mail around about Jack not being here tomorrow. Don't forget this Saturday is Free Pattern & Demo Day. I don't know what Grandma has up her sleeve this month. But I'm sure it will be interesting. Don't forget to pick up your fabric swatches for the Fabric Challenge! Time is running out. We've gotten several people signed up so far. We would love to for this Fabric Challenge to be big. Especially, since we're going to take the Fabric Challenge entries to the Quilt Exhibit at the Bidding Barn in Troy, PA for Mother's Day weekend. The organizers are excited about us bringing them to the Exhibit. 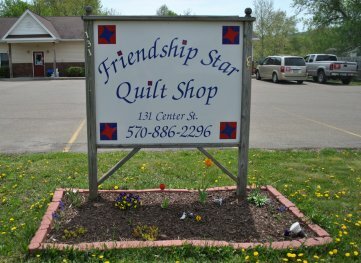 They are trying to show what you Quilter's love to do and the creativity it takes to make beautiful quilts.